Sunday was a real mixed bag of a forecast. The three 'reliable' soundings all suggested different weather conditions ranging from it being a totally blue day through to it being completely overcast. RASP didn't help and the forecasts from Dunstable, Lasham and Nympsfield carried a consistant message of "we haven't got a clue". Undeterred by this uncertainty, we set a club 'A' task of Booker Bridge (BOB) - Enstone (ENS) - Buckingham (BUC) - Didcot (DID) - Booker (BOO) of 159km. 'B' task was Booker Bridge (BOB) - Bicester (BIC) - Westcott (WES) - Booker (119km). Most pilots elected to have a go at the 'A' task and Dave Caunt (918), Shack (WD) and Jim Pengelly (208) completed it. Gary (732) wussed out on the way back from Thame and skipped the Didcot leg (having been to Thame and back earlier and felt uncomfortable with the ever lowering cloudbase). Anyway, a fun day, with everybody agreeing that conditions ranged from "weird" to "tricky".....great practice for the forthcoming competition season! The forecast for Friday 19th was for good conditions along the south coast. A sea breeze near Eastbourne and a coastal convergence out to sea past Brighton made for an interesting day out. Photos: Running towards Beachy Head, sea breeze near Eastbourne, Brighton pier, Shoreham airfield. Excellent weather and good hospitality led to some great flying. Mike C, Shack, and I all flew 500s, John H, Jeremy G, and Gliding Ben flew 300s. Jeremy also claimed his 5 hours. Much local flying was done and the highlight was Nick Newton and his good lady providing strawbugs and ice cream. Away from home John Gatfield and Matt Cook flew 750s out of Bicester and even Glyn Reed flew a handsome XC in G1 out of Lasham. Thanks go to everyone at the Upward Bound Trust for their willingness to help us gliding louts go flying this weekend. Apologies to any notable achievements missed. Write your own blog! 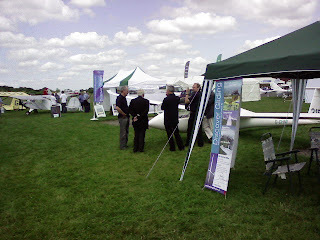 For the 4th year AeroExpo took over Wycombe Air Park for 3 days and Booker Gliding Club took advantage of the crowds of aviation minded visitors to sell gliding. If only the event was in November! Under the perfect gliding sky a team of club members spent 3 days answering questions like 'what would be a good day for gliding?' - today would! However, it was worth the sacrifice as we did brisk trade with power pilots and helicopter pilots who were soon convinced that gliding offered much better value and more interesting and challenging flying experiences than what they were currently doing. We look forward to seeing them all at the launch point. As the Aero Expo has taken over our airfield for a few days we have decamped to Thame where our hosts The Upward Bound Trust have given us their usual friendly welcome. We have two tugs based there and launched the fleet at around Midday. I had set THM DEV LIT THM for a 400 for the flappers and THM WAN LIT THM for the standards (and club). Wind was a bit stonger than expected and the thermals to the West were not round! 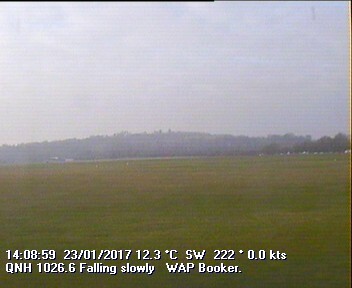 Found it a bit difficult nearly landing back on the second leg but got into really good air near Bedford and romped up and around LIT. On the way back it became apparant that things were going to get difficult. AltoCu had arrived cutting off the sun enroute so I glid into Dunstable for a weak climb then Halton for a save arriving back at Thame with just a couple of hundred feet on best glide to spare. Most got back but Will landed at Halton and Denis (who had set a 500 in an attempt to beat me with his huge bomber handicap) started his donk at St Neots. I thought someone who flew a good flight would post! Thursday turned out pretty much as expected except it didn't go blue in the SW. Longest flight was flown out of Lasham by Dave Masson at 719k twice up and down to the Welsh borders. The fastest by Dave Watt out of Bicester round Lasham and Ledbury 300k at 100kph. In contrast I decided to fly a 300 round Cerne Abbas and Frome. The day started with cloudbase just above 3000ft above Booker and the first leg was pretty miserable. I never seemed to get a climb out of which I was able to take more than 500ft without moving on until I got beyond Salisbury where I started to get good climbs to cloudbase at about 4500ft. By then the sea breeze was in full flow and a convergence line had set up between me and my first turn. The cloudbase was low and soggy and I gave up about 12k out from CER. On reflection, I guess if I back tracked and took a big cloud climb I would have been able to round the turn and get back to the good air. Who knows? The next climb I took from about 1500ft near Wincanton to 5500ft cloudbase and really whizzed along round Frome and past Keevil. Here things took a turn for the worst and I ended up low at Welford. But not as low as Geoff Tabbner or the three gliders below me in the fields! I did scratch a 1000ft which got me to a good climb and on towards home. Took what I thought would be a last climb at Goring but had a very poor glide and had to top up 400ft at Stonor to get in over the hedge to land ahead. 280k of my 310 task completed at 83Kph left me a bit disappointed but a nice day out nevertheless. Should have listened to a weather expert and followed Nils! If you can fly Thursday or Friday you should as the weekend looks overcast and rainy. Tomorrow Thurs will start cold at 2C (cover your veg) and will rise to 16-18C with good climbs and cloudbase and light NNE'ly. North and East of Northampton will be affected by N Sea air which will lower temperatures and clag up. 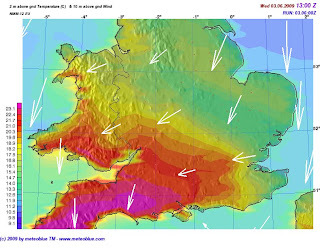 The SW will be hottest 23C but is expected to go blue. I think that 500+ is on but in a limited task area. Stay below a line from Snowdon to Northampton. The wind is not strong enough for ridge lift on the South Downs but there will be plenty of climbs down there. Go West as far as you like but expect blue. I have'nt looked at Friday thoroughly yet but it should be OK for XC.